Protein, carbohydrate and lipid amounts were determined for several rotifer species collected directly from the field. Brachionus calyciflorus was the most abundant species; therefore making possible more data for it. An increase in protein content of this species occurred when its concentration in food (μg protein/ml) also increased. Keratella tropica showed a similar pattern, but Asplanchna brightwelli did not. 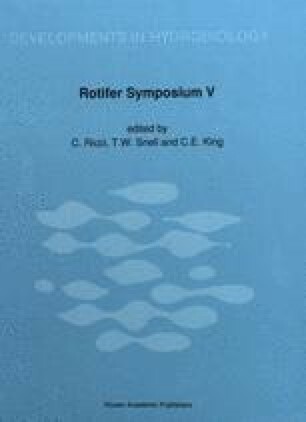 Carbohydrate proved to be the main form of storage in rotifers. In Brachionus calyciflorus females bearing no egg, 8% of the total biomass was carbohydrate; in females bearing one egg, 15% carbohydrate was found. Lipid does not appear to be used for storage since no increase in the amount of lipid was detected in females bearing eggs or embryos. This suggests that lipid has a structural function. Finally, a relationship between rotifer body volume and protein content at a given food concentration was obtained. The cladoceran Daphnia magna follows the same pattern.